Manchester United boss Louis van Gaal said his side were having a "lousy period" of injuries after Phil Jones and Ander Herrera were taken off in their Premier League win at Watford. Defender Jones twisted an ankle and midfielder Herrera injured a hamstring, and both miss Wednesday's Champions League game with PSV Eindhoven. 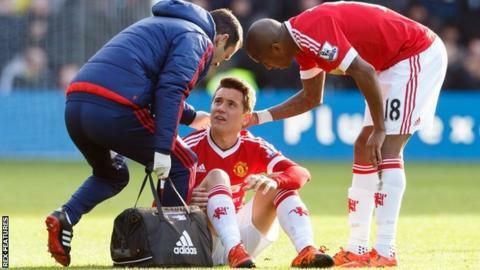 Van Gaal said: "The first impression is they are not heavy injuries." A late Troy Deeney own goal gave Van Gaal's side a 2-1 win at Vicarage Road. Deeney bundled Bastian Schweinsteiger's cross into the net having cancelled out Memphis Depay's opener just three minutes earlier. Jones and Herrera join a list of absentees that now totals nine players, leaving the Dutchman short of options for Wednesday's game at Old Trafford. Strikers Wayne Rooney and Anthony Martial missed out against the Hornets, which gave Depay a chance to start his first league match since 4 October. "Rooney is ill and illness is a matter of days, not weeks," said Van Gaal. "Martial has a foot problem. It is not so heavy as the media has written but you never know. We have to wait and see." Having said on Friday he expected more from £31m summer signing Depay, Van Gaal was pleased with his fellow Dutchman's contribution on Saturday. He said: "The first goal was superb. It was a fantastic pass from Herrera. Depay finished it very well. I also think he played a very good game in the first half."